I love bacon so much that it needs to be a food group all of it’s own! This summer I have been eating a ton of BLT’s. I have 4 tomato plants in my garden that are growing like mad. What makes it really simple for me is Hormel has this pre-cooked bacon. Now I like my bacon a touch on the crisp side so I cook it for about a minute to give it a good crunch. Super easy and super fast. Now what else could you use the food group bacon for? Here are a couple recipes I found that look awesome. Slice bacon in half; wrap one piece bacon around one chestnut. 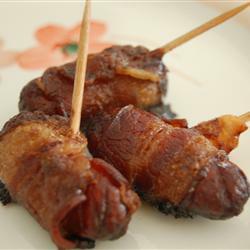 Skewer with toothpick to hold in place.2.Broil in toaster or conventional oven, turning frequently, until the bacon is evenly cooked. Serve warm. 2. Refrigerate 2/3 of the bacon until needed. It is easier to wrap the wieners with cold bacon. Wrap each cocktail wiener with a piece of bacon and secure with a toothpick. Place on a large baking sheet. Sprinkle brown sugar generously over all. 3. Bake for 40 minutes in the preheated oven, until the sugar is bubbly. To serve, place the wieners in a slow cooker and keep on the low setting. Remember an easy way to wrap both of these is to use Hormel pre-cooked bacon. Makes cooking easy which is what I need! !